Rachel Fisher graduated from Southern Illinois University Edwardsville in 2012, where she studied violin and creative writing. Rachel has been a member of many orchestras over the years, including the Lincoln Youth Symphony, the St. Charles County Youth Orchestra (Assistant Concertmaster), the Southern Illinois University Edwardsville Symphony Orchestra (Assistant Principal Second), the St. Louis Philharmonic Orchestra, and the Symphony Orchestra of Northern Virginia in Arlington (Principal Second). She currently performs with the Columbia Orchestra. 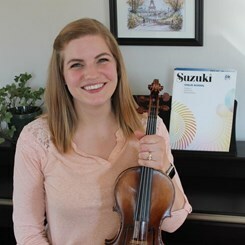 While a student at Southern Illinois University Edwardsville, she became certified to teach Suzuki violin through Suzuki book 4 under the instruction of Vera McCoy-Sulentic. Rachel has been teaching since high school, and loves to work with students of all ages. In addition to her love for playing the violin and viola, Rachel also enjoys spending time reading, playing the piano, cooking, and spending time with her husband and two young children.